It’s the nature of triangles that no one side can be longer than the sum of the other two sides: For triangle ABC, AC ≤ AB + BC. This is the triangle inequality. Euclid proved it (Book I, Proposition 20). With appropriate definitions it holds for triangles on the surface of a sphere as well as on a plane. And the everyday human experience of moving around in the universe amply confirms it. Unless you are booking a flight from Boston to Philadelphia. Yesterday I had to arrange such a trip on short notice. I was offered a choice of several direct flights, with the cheapest round-trip ticket priced at $562. But I could get there and back for just $276 if I went via Detroit. I am fascinated and appalled by the economics of this situation. From one point of view it makes perfect sense: A direct flight is faster and more convenient, so of course it should command a premium price. But when you look at the cost side of the equation, it seems crazy: The Detroit detour quadruples the mileage and adds an extra takeoff and landing. Shouldn’t those flyers who long for a view of Lake Erie and a stopover in the Motor City be asked to pay extra for the privilege? The usual explanation of this paradox is the marginal-cost argument. If the BOS-PHL route is saturated, but there are empty seats on the BOS-DTW and DTW-PHL legs, the airline is better off filling the vacant seats at any price above the marginal cost of adding a single passenger. If the price is too attractive, however, customers will defect from the premium flight. No doubt the observed price differential was determined by some optimization program running in the airline’s back office, nudging the system toward an equilibrium point. Sound sensible? Suppose I had wanted to go to Detroit instead of Philadelphia. When I looked up the fares this morning, I found that the cheapest nonstop BOS-DTW ticket is $1,224. But I could pay as little as $578 if I were willing to make a detour through—guess where—Philadelphia. Now it appears the load factors are reversed: It’s the Beantown–Motown corridor where demand is strong, while the City of Brotherly Love takes up the slack. If that program in the back office were trying to optimize overall system efficiency—perhaps aiming to minimize aggregate passenger travel time as well as fuel consumption, pollution, labor inputs and other resources—I have a hard time believing it would come up with a solution anything like the itinerary I’m following today. By the way, I’m not going to Detroit. I’m making a stop in Queens instead. At least the triangle is skinnier. Update: Totally triangular. On the first leg of the trip, we pushed away from the gate at Logan airport and the pilot immediate announced that we’d be waiting an hour or more before takeoff because of air traffic congestion at JFK. What could cause such congestion? You don’t suppose the problem might possibly be caused or exacerbated by pricing policies that encourage people flying from Boston to Philadelphia to stop in New York? As it turned out, the delay was only 10 or 15 minutes rather than an hour, and I made my connection to the Philadelphia flight. On the return trip, I was getting emails and phone messages from the airline as I waited barefoot in the security queue at PHL. My departure time had been pushed back by 30 minutes, again because of JFK congestion. When I got to the gate, a weary but helpful agent told me: “If you want to get home tonight, go to Cincinnati.” So I took the fat triangle, flying 1,244 miles to go just 268 (a worse ratio than the Detroit route). Is all this just the whining of an unhappy traveler? Maybe, but I there’s an economic puzzle that I’m wanting to solve. What rational business strategy rewards a customer or a company for wasting 1,000 miles worth of fuel? This entry was posted in mathematics, modern life. To update the old saying: the grass is always greener on the other two sides. It is crazy sometimes. I once booked a flight from LAX->Dulles->Norfolk, didn’t check any bags, and simply got off at Dulles because booking the two leg trip from LAX to Norfolk was cheaper than booking the “non-stop” ticket from LAX to Dulles. Keep in mind that the prices that you were offered might not be the sames prices that I would see if I was trying to book the same flights- revenue management systems are starting to compute specific prices for each customer rather than just having a “price” for the flight. Sounds like it might be some sort of price discrimination strategy. Suppose there are two types of customers: Patient customers who are willing to take a longer tip for lower prices, and impatient customers who are willing to pay significantly more for faster trips. If the airline offers everyone the most efficient route, it cannot distinguish between these two types and has to offer everyone the same price (in mechanism design this is known as a pooling equilibrium). Depending on the frequency of each type, the airline’s profit maximizing price might be a low price that patient customers are willing to pay. Impatient customers would pay more, but they don’t have to because everyone gets the same deal. But if the airline creates an alternative, slower route and sets the prices correctly, they can induce customers to self-select so that the patient customers take the slow route and the impatient customers take the fast route (a separating equilibrium). In this case, the airline can charge both types the maximum that they are willing to pay. The additional profits may outweigh the higher fuel costs. Of course, it would be even better for the airline if they could set up equivalent payoffs without the higher fuel costs. Perhaps customers could choose between a cheap flight plan that forces you to sit in a waiting room for 2 hours, or a more expensive direct-to-the-plane flight plan. But this might make the manipulation a little too transparent. I think the polite term is “market segmentation” rather than “price discrimination,” but, yes, that’s what it’s all about. Earlier strategies for maintaining multiple price tiers included advance-purchase requirements, the Saturday-night-stay, time-of-day premiums and varying policies for refunds and itinerary changes. What’s different about charging a premium for nonstop flights is that it enforces a deliberately inefficient solution to the underlying network flow problem. By a simple reshuffling of flights, all the passengers could be delivered to the same destinations more quickly and at lower cost—benefiting both parties to the transaction. When a superior solution is known to exist but an economic mechanism fails to reach it, that seems like a problem worth poking at. And it has consequences beyond making customers like me grouchy: Last year U.S. airlines burned 16 billion gallons of fuel. Fewer detours to Cincinnati would have a huge impact on the national hydrocarbon budget. Could be that if the flights are already booked, and must be flown, then fuel isn’t a factor. Less time is more money? Wouldn’t the train or bus have been both cheaper and quicker? 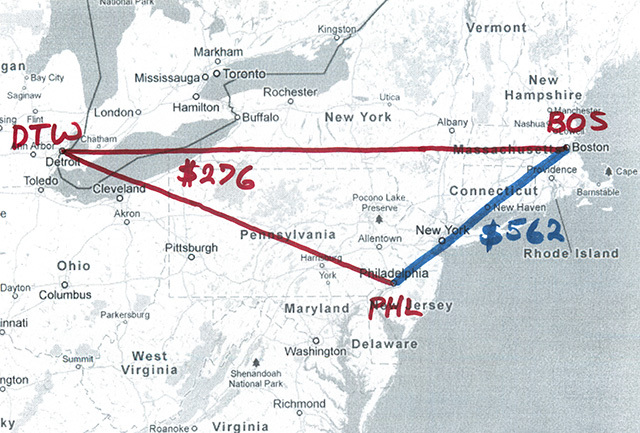 The fastest train between Boston and Philadelphia takes five hours and costs $465 round trip (two hours longer and $200 more than the roundabout air route). Buses take seven hours, though fares are much lower. On this trip I didn’t have the time to spare. Given that this is downtown to downtown, and travelling to/from airport, no waiting, no secruity, no layover, it should be the more sensible choice in many instances. And if you book more than a day in advance, the prices should be lower. When I moved to California in 1972, I was surprised to find out that a phone call from San Francisco to Los Angeles was more expensive than a call from SF to Las Vegas plus a call from Vegas to LA. I think it’s a matter of whose point of view you are looking at: The 1000 mile deviation is from your point of view. From the view of the airline, it is just a resource allocation, similar to Internet packets. So people who expect better QoS (shorter travel time, less transits) pay more, while others put up with what they are willing to pay. That certainly plays havoc with the Traveling Salesman Problem….. I must say that my experience on flying around, based mostly in Europe, reaches similar absurdities, but usually the logistic price they save is more clear. In the Europe playground, you have lots of different companies, many of which (including, usually, the cheap ones) are small, and have a home airport. Therefore, the deals they offer are, most of the time, a two leg flight - from your origin to the home airport, and from the home airport to your destination. A direct flight usually costs more, because your destination might not be one of the cheap company airports. Now, in this case, it is clear why holding most of their services, offices, etc. only in one airport, and having all their planes running back and forth on the spokes of a wheel, should be much cheaper than saving some fuel. I have yet to see an actual reverse triangle inequality. However, it is still surprising that the cheapest flights aren’t always those of the local cheap company, even when available - this summer, I’m flying from Warsaw to Israel via Copenhagen. I fly with Scandinavian Airlines, which follows my theory. However, the Polish LOT, which is based at Warsaw, is a fairly cheap company, and it would sound reasonable for them to have the direct flight at around half (or two-thirds, at most) the price - but there is none to be seen. Here, perhaps, balancing of market prices kicks in - or maybe they count their tickets in doubles, assuming no-one wants to stay at their airport.